Jan. 22, 2013, 3:42 p.m.
A few hints of web-native storytelling are in the Times’ repackaged print sections. By Adrienne LaFrance @adriennelaf Jan. 22, 2013, 3:42 p.m.
Science Times has a new design and an array of features to reflect the growing role of science, medicine and health in the news and society. Among them are The Week, a review of science news and a look ahead; and AskWell, in which journalists and experts answer readers’ health questions. We welcome comments on the changes, which can be e-mailed to scitimes@nytimes.com. It’s part of a larger, subtle print redesign for the Times’ features pages, with newly designed sections being rolled out each day from now until Sunday. The sections were created in the 1970s under Abe Rosenthal and haven’t undergone a full redesign since then. But unlike with some newsprint reboots, the Times wouldn’t mind if you didn’t notice the change. It’s a print feature that feels webby in this curation-heavy era of retweeting and reblogging, but it’s also true that aggregation has deep roots in print. For his part, Bodkin’s most excited about a new grid-design infrastructure that will anchor content and help balance the tension between continuity and variety. The grid — four equal columns and one narrow one that can be used to separate elements — will mean that design differences among features sections are deliberate rather than arbitrary, something that hasn’t always been the case as the feature sections have evolved in recent decades. The grid design is like “a rhythm with an offbeat,” Bodkin says, a way to separate different kinds of storytelling. That includes bringing to print more content that’s native to the web. 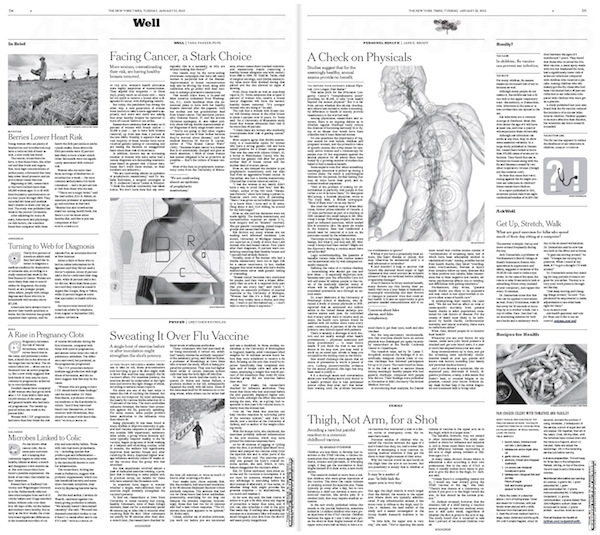 Well, once strictly a NYTimes.com blog, is now a self-contained pull-out spread dedicated to personal health. Vows has also been retooled as a standalone package for Sunday Styles. 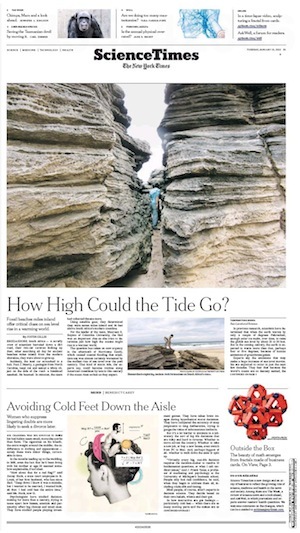 Because Bodkin heads up the entire New York Times art department — that includes print and digital — a print redesign is inherently wrapped up in the paper’s ongoing online redesign process. That’s evident in matching typography online and in print, but it’s also true from a development sense. “The two products are constantly speaking to each other and we want them to reflect each other,” Bodkin says. It’s also clear he sees the print redesign as serving a distinct audience of readers. POSTED Jan. 22, 2013, 3:42 p.m.
LaFrance, Adrienne. "For The New York Times, redesigns happen in print, too." Nieman Journalism Lab. Nieman Foundation for Journalism at Harvard, 22 Jan. 2013. Web. 19 Apr. 2019. LaFrance, Adrienne. "For The New York Times, redesigns happen in print, too." Nieman Journalism Lab. Last modified January 22, 2013. Accessed April 19, 2019. https://www.niemanlab.org/2013/01/for-the-new-york-times-redesigns-happen-in-print-too/.